Sound can be measured accurately. The term decibel (dB) refers to an amount of energy moving sound from its source to our ears or to a microphone. A drop of more than 10 dB in the level of sound a person can hear is significant. Sound travels through a medium like air or water as waves of compression and rarefaction. These waves are collected by the external ear and cause the tympanic membrane (ear drum) to vibrate. The chain of ossicles connected to the ear drum—the incus, malleus, and stapes—carries the vibration to the oval window, increasing its amplitude 20 times on the way. There the energy causes a standing wave in the watery liquid (endolymph) inside the Organ of Corti. (A standing wave is one that does not move. A vibrating cup of coffee will demonstrate standing waves.) The configuration of the standing wave is determined by the frequency of the sound. Many thousands of tiny nerve fibers detect the highs and lows of the standing wave and transmit their findings to the brain, which interprets the signals as sound. Hearing can be interrupted in several ways at each of the five steps. The external ear canal can be blocked with ear wax, foreign objects, infection, and tumors. Overgrowth of the bone, a condition that occurs when the ear canal has been flushed with cold water repeatedly for years, can also narrow the passageway, making blockage and infection more likely. This condition occurs often in Northern Californian surfers and is therefore called "surfer's ear." The ear drum is so thin a physician can see through it into the middle ear. Sharp objects, pressure from an infection in the middle ear, even a firm cuffing or slapping of the ear, can rupture it. It is also susceptible to pressure changes during scuba diving. 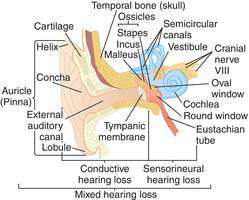 Several conditions can diminish the mobility of the ossicles (small bones) in the middle ear. Otitis media (an infection in the middle ear) occurs when fluid cannot escape into the throat because of blockage of the eustachian tube. The fluid that accumulates, whether it be pus or just mucus and dampens the motion of the ossicles. A disease called otosclerosis can bind the stapes in the oval window and thereby cause deafness. All the conditions mentioned so far, those that occur in the external and middle ear, are causes of conductive hearing loss. The second category, sensory hearing loss, refers to damage to the Organ of Corti and the acoustic nerve. Prolonged exposure to loud noise is the leading cause of sensory hearing loss. A million people have this condition, many identified during the military draft and rejected as being unfit for duty. The cause is often believed to be prolonged exposure to rock music. Occupational noise exposure is the other leading cause of noise induced hearing loss (NIHL) and is ample reason for wearing ear protection on the job. A third of people over 65 have presbycusis—sensory hearing loss due to aging. Both NIHL and presbycusis are primarily high frequency losses. In most languages, it is the high frequency sounds that define speech, so these people hear plenty of noise, they just cannot easily make out what it means. They have particular trouble selecting out speech from background noise. Brain infections like meningitis, drugs such as the aminoglycoside antibiotics (streptomycin, gentamycin, kanamycin, tobramycin), and Meniere's disease also cause permanent sensory hearing loss. Meniere's disease combines attacks of hearing loss with attacks of vertigo. The symptoms may occur together or separately. High doses of salicylates like aspirin and quinine can cause a temporary high-frequency loss. Prolonged high doses can lead to permanent deafness. There is an hereditary form of sensory deafness and a congenital form most often caused by rubella (German measles). Sudden hearing loss—at least 30dB in less than three days—is most commonly caused by cochleitis, a mysterious viral infection. The final category of hearing loss is neural. Damage to the acoustic nerve and the parts of the brain that perform hearing are the most likely to produce permanent hearing loss. Strokes, multiple sclerosis, and acoustic neuromas are all possible causes of neural hearing loss. Hearing can also be diminished by extra sounds generated by the ear, most of them from the same kinds of disorders that cause diminished hearing. These sounds are referred to as tinnitus and can be ringing, blowing, clicking, or anything else that no one but the patient hears. An examination of the ears and nose combined with simple hearing tests done in the physician's office can detect many common causes of hearing loss. An audiogram often concludes the evaluation, since these simple means often produce a diagnosis. If the defect is in the brain or the acoustic nerve, further neurological testing and imaging will be required. matter in the ear canal can be easily removed with a dramatic improvement in hearing. surfer's ear gradually regresses if cold water is avoided or a special ear plug is used. In advanced cases, surgeons can grind away the excess bone. middle ear infection with fluid is also simple to treat. If medications do not work, surgical drainage of the ear is accomplished through the ear drum, which heals completely after treatment. traumatically damaged ear drums can be repaired with a tiny skin graft. surgical repair of otosclerosis through an operating microscope is one of the most intricate of procedures, substituting tiny artificial parts for the original ossicles. Sensory and neural hearing loss, on the other hand, cannot readily be cured. Fortunately it is not often complete, so that hearing aids can fill the deficit. In-the-ear hearing aids can boost the volume of sound by up to 70 dB. (Normal speech is about 60 dB.) Federal law now requires that they be dispensed only upon a physician's prescription. For complete conduction hearing loss there are now available bone conduction hearing aids and even devices that can be surgically implanted in the cochlea. Tinnitus can sometimes be relieved by adding white noise (like the sound of wind or waves crashing on the shore) to the environment. Decreased hearing is such a common problem that there are legions of organizations to provide assistance. Special language training, both in lip reading and signing, special schools and special camps for children are all available in most regions of the United States. Conductive hearing loss can be treated with alternative therapies that are specific to the particular condition. Sensory hearing loss may be helped by homeopathic therapies. Oral supplementation with essential fatty acids such as flax oil and omega 3 oil can help alleviate the accumulation of wax in the ear. Decibel — A unit of the intensity of sound, a measure of loudness. Meniere's disease — The combination of vertigo and decreased hearing caused by abnormalities in the inner ear. Multiple sclerosis — A progressive disease of brain and nerve tissue. Otosclerosis — A disease that scars and limits the motion of the small conducting bones in the middle ear. Stroke — Sudden loss of blood supply to part of the brain. Prompt treatment and attentive follow-up of middle ear infections in children will prevent this cause of conductive hearing loss. Control of infectious childhood diseases such as measles has greatly reduced sensory hearing loss as a complication of epidemic diseases. Laws that require protection from loud noise in the workplace have achieved substantial reduction in noise induced hearing loss. Surfers should use the right kind of ear plugs. Alexander Graham Bell Association for the Deaf. 3417 Volta Place NW, Washington, DC 20007. (202) 337-5220. http://www.agbell.org. Auditory-Verbal International. 2121 Eisenhower Ave., Suite 402, Alexandria, VA 22314. (703) 739-1049. 〈avi@auditory-verbal.org〉 〈http://www.auditory-verbal.org/contact.htm〉. Central Institute for the Deaf. Washington University. St. Louis, Missouri. 〈http://cidmac.wustl.edu〉. League for the Hard of Hearing. 71 West 23rd St., New York, New York 10010-4162. (212) 741-7650. http://www.lhh.org. National Association of the Deaf. 814 Thayer Ave., Silver Spring, MD, 20910. (301) 587-1788. 〈http://nad.policy.net〉. Self Help for Hard of Hearing People, Inc. 7800 Wisconsin Ave., Bethesda, MD 20814. (301) 657-2248. http://www.shhh.org. The Sight & Hearing Association (SHA). http://www.sightandhearing.org. World Recreation Association of the Deaf (WRAD). http://www.wrad.org. A reduction in the ability to perceive sound; may range from slight inability to complete deafness. See also: deafness, threshold shift. conductive hearing loss conductive deafness; that due to a defect of the sound-conducting apparatus, i.e., of the external auditory canal or middle ear. functional hearing loss hearing loss that lacks any organic lesion. mixed hearing loss hearing loss that is both conductive and sensorineural. nonorganic hearing loss functional h. l.
ototoxic hearing loss that caused by ingestion of toxic substances. sensorineural hearing loss that due to a defect in the inner ear or the acoustic nerve. an inability to perceive the normal range of sounds audible to an individual with normal hearing. Hearing loss may be greater at some frequencies than others, or all frequencies may be equally affected. Conductive hearing loss is a result of damage to the outer or middle ear, whereas sensorineural hearing loss results from damage to the cochlea or auditory nerve. The loss is measured in decibels and may be described as mild, moderate, severe, or profound. An ↓ ability to hear, which may be genetic or acquired, pre- or postlingual, and syndromic or nonsyndromic. See Noise-induced hearing loss, Occupational hearing loss, Prelingual hearing loss, Postlingual hearing loss, Sensorineural hearing loss. Failure of normal perception of sounds or of sounds of a particular range of frequencies. Most hearing loss involves the higher frequencies. Hearing loss may be conductive, due to mechanical defects or obstruction in the ear, or sensorineural, due to damage to the inner ear nerve mechanisms. Reduction in ability to perceive sound; may range from slight inability to complete deafness. n a reduction in the acuity to detect and recognize sound. n a hearing impairment of the outer or middle ear, which is due to abnormalities or damage within the conductive pathways leading to the inner ear. n a hearing impairment that is the result of damage to both conductive pathways of the middle ear and to the nerves or sensory hair cells of the inner ear. n a hearing impairment of the inner ear resulting from damage to the sensory hair cells or to the nerves that supply the inner ear. partial or complete loss of hearing; see also deafness. With a large sample size, long follow-up period, and objective assessment of hearing loss, our study provides strong evidence that smoking is an independent risk factor of hearing loss,' Hu said. If you have hearing loss, seek appropriate medical attention. In a study that investigated 114 children in the USA, hearing loss associated with meningitis was found in 3. Distribution of type and degree of hearing loss across age and gender. Drugs induced sensorineural hearing loss was also included in the list of exclusion criteria. Hearing loss prevalence in children has been estimated to be a 0. Is there a silent hearing loss among children in Jordan? Hearing loss can result from many factors, such as diseases of the ear, genetics, noise and medicines. Critique: Exceptionally well written, organized and presented, ""The Hearing-Loss Guide: Useful Information and Advice for Patients and Families" truly lives up to its titles and is very strongly recommended for non-specialist general readers confronting hearing loss, for family members and friends, and for others who work alongside or care for a person with a hearing impairment. Hearing loss may lead to difficulties in singing and result in artistically unacceptable performance. This could lead to difficulties in understanding speech during age-related hearing loss which affects up to half of people over the age of 65.